OTTAWA - William Powell ran a 43-yard touchdown in the game's final minute as the Ottawa Redblacks rallied to a 41-36 victory over the Hamilton Tiger-Cats on Friday to take the lead in the Canadian Football League's East Division. Trevor Harris threw two touchdown passes, Powell passed 1,000 yards rushing for the season and Diontae Spencer set a new league record with 496 all-purpose yards for the Redblacks (8-9-1). Ottawa will finish the regular season in first in the division if the Argonauts lose to the B.C. Lions next week. A Toronto win or tie in the final week of the regular season will put the Argos in the East's top spot for the playoffs. Jeremiah Masoli threw four touchdown passes for the Tiger-Cats (5-12), who are playing out the string as they have been eliminated from the post-season. 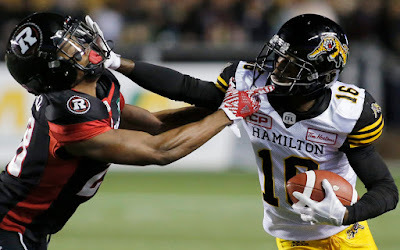 An eight-yard touchdown pass from Masoli to Luke Tasker at 6:02 of the third quarter gave the Tiger-Cats a 33-22 lead but Harris threw a 12 touchdown pass to Greg Ellingson with less than five minutes to play following an eight-yard touchdown run by Powell with five minutes to play for a 34-33 lead. Kenny Allen gave Hamilton a 36-34 lead with a 43 yard-field goal at 13:35 of the fourth quarter before Powell scored his 43-yard run in the final minute to give the Redblacks the win and get over the 1,000 yard mark.